Across the board, this countertop material is the most reliable and is a definite fan favorite. It is super easy to clean and requires minimal maintenance, while providing a beautiful look to almost any design. Experts recommend rounding the edges, to reduce chipping. A cult classic. Each slab is unique so you are sure your kitchen design is truly one of a kind. You do have to periodically reseal to maintain look and reduce staining potential, but granite is heat and scratch resistance. 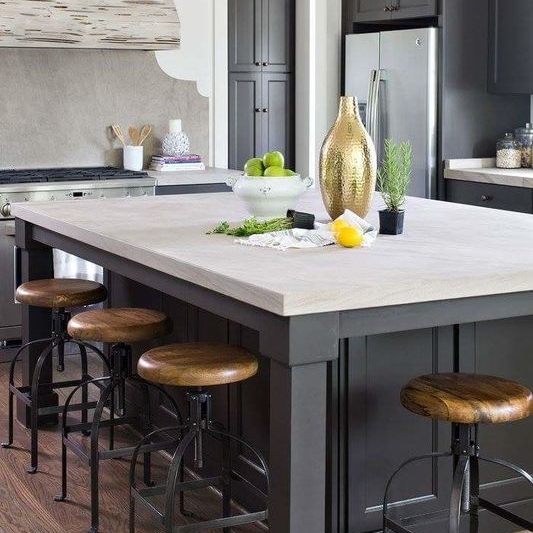 A newer trend, the butcher block is easy to install and gives a warm touch to many designs. The trick is applying the appropriate finish and religiously re-applying as needed. Another new, and more eco-friendly, trend: recycled glass is available in large or small shards for personal preferences. Most are heat and strain resistant but not all so be careful when searching. Not to be mistaken for the laminate tops of yesteryear, new laminates look more natural and provide the stain and heat resistance, but beware: scratches and cuts will permanently ruin the surface so utilize a cutting board. Another classic look, marble is beautiful and can take a design to the next level. Marble is easy to nick and scratch and is not heat resistant. While natural looking and heat resistant, it suffers the same issues as marble- easy to damage and stain. But, it is quite beautiful! A strong character, concrete can be shaped and colored to any preference, but maintenance is an issue. A naturally porous material, stains do damage unless treated with a sealant. Sadly, once a sealant is applied, the surface is no longer heat resistant. A beautiful and sometimes underrated countertop, soapstone does not need a sealant and is easily cleaned with soap and water. It is quite soft so nicks and scratches show up easily and the color does naturally darken over time. Which countertop does your current kitchen feature? 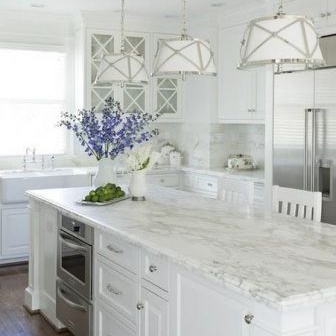 Which countertops are your favorites?